When I first started working at my first major PR agency job I learned pretty quickly that me and my fellow lower level underlings would be doing most of the grunt work (writing pitches, calling editors, building media lists) and my superiors would basically be the face of the company, figure out budgets and pitch new clients. Overall that concept is great considering the fact that I received tons of writing and PR experience but you must also realize that I was fresh out of college (Go Bisons!) and had one lone PR internship under my belt, and though I was always considered a great writer the pressure of writing something on behalf of Procter & Gamble (or any other equally important client) to some enigma of an editor was a bit scary. At the end of the day it always surprised me that we (those entry level, one step above an intern employees) were given such a responsibility with not much direction or support from our bosses. 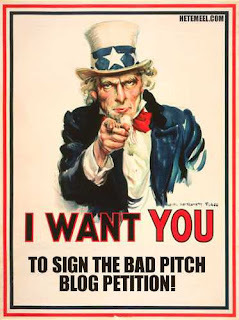 I say all that to say that I bet many of the people who make The Bad Pitch Blog are poor little underlings like myself at the time, who are just trying to do their job and be as witty and creative with their pitches as the next little underling. See for yourself examples of bad pitches and and all you pr folks just hope you don't see your letterhead anywhere! Wanna know about Paper Media NYC? Paper Media NYC is a vibrant New York City based communications agency that specializes in corporate branding through tactical marketing and media relations campaigns. With a focus on public relations, traditional, grassroots and online marketing techniques, we work with businesses to take their enterprise to the next level by increasing their brand visibility while expanding their overall corporate model. We don’t rely on one cookie cutter method to obtain success but instead access years of communications experience with an array of corporate clients to access each situation individually and create unbridled strategic and creative programs.